The Bench Press is a wildly popular exercise among gym goers and athletes alike. Unfortunately, most perform this exercise incorrectly thus being stuck pressing the same weight year in and year out or worse putting themselves at risk for injury. During my days teaching PE at Plant High School I can’t tell you how many times I was asked how much do you Bench Coach? I would never answer the question as I knew most of my kids would perform this great exercise incorrectly or try and press too much before they were ready and end up hurting themselves. 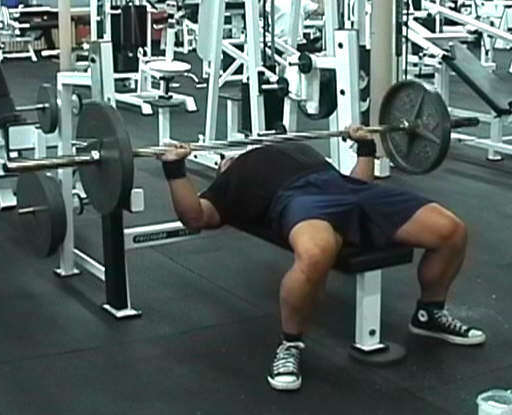 Clearly, the bench press has an upper body focus that can add slabs of muscle to your chest, shoulders and triceps but what most people don’t realize is that you must have a strong upper back and proper hip mobility in order to perform this exercise correctly and get the maximum benefit out of your lifts. You see, the bench is a total body lift and in order to lift maximum weight your entire body must work in unison so that the athlete or individual can achieve optimal gains. When setting up for the lift you must set your feet flat on the floor and slightly behind your knees. That’s right, feet flat on the floor! The feet must be actively driven down into the floor during the entire lift. This will allow for more control during the lift and allow you to engage the posterior chain, thus resulting in a bigger lift! Sometimes, rather most of the time, when I start with a new athlete they can’t set up in this position. Typically the problem is tight hip flexors or lack of mobility in the hips. You need to incorporate hip mobility drills such as band walks and various hip flexor stretches so you can set up and better yet, stay in the proper position throughout the lift. Keep your shoulders back throughout the lift! In my experience most young lifters are incapable of keeping their shoulders back throughout the lift. Typically after one rep the athlete’s shoulders are in a protracted position thus making them weaker for subsequent reps and putting them in a position that they will eventually experience shoulder pain. The athletes at Tampa Strength perform numerous upper back activation/strength exercises that teaches them to keep their shoulders back throughout the lift and pretty much every other exercise we perform at our facility. Band Pull aparts, Ys, Ws, I, Ts, and blackburns are all great exercises that will teach you to keep your shoulder packed/retracted throughout the lift. Shoulders packed is a term all my clients/athletes are familiar with and this retraction of the shoulder girdle will help keep proper form while benching and help you add plenty of beef to those pecs!